Don’t you just hate stereotypes? Just because something is durable enough to be called outdoor furniture doesn’t mean that it isn’t stylish enough to be used inside, too. 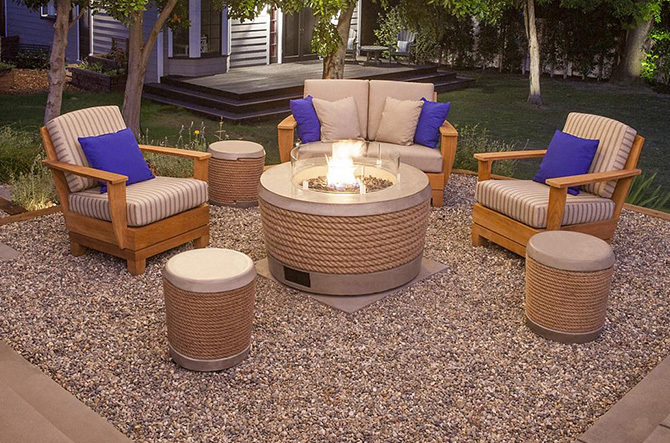 We found several examples of outdoor furniture that don't look or feel like “typical” outdoor furniture. If so inclined, you could reasonably insert these pieces into your living room or dining room without sacrificing one ounce of comfort or modern design. Take that, pre-conceived notions. The Sixties Armchair is a lounge chair designed by Fermob with the explicit intention of being used indoors as well as out. Fashion-forward color palettes and a surprisingly comfortable seat of woven resin make it a fun and airy addition to an interior space. 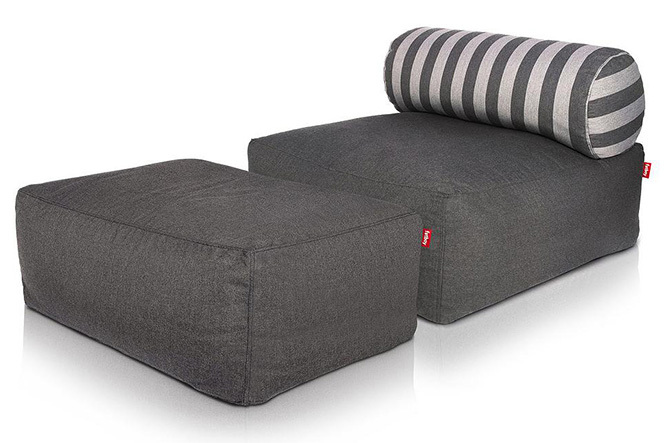 The Fatboy Tsjonge Lounge and Jonge Ottoman are so cushy that, unless you were told otherwise, you wouldn’t know they were actually designed for outdoor use. These modular pieces can be mixed and matched with other colors and patterned bolster pillows to create a custom lounging set. The industrial mix of metal and wood slats is right on trend for modern exteriors. 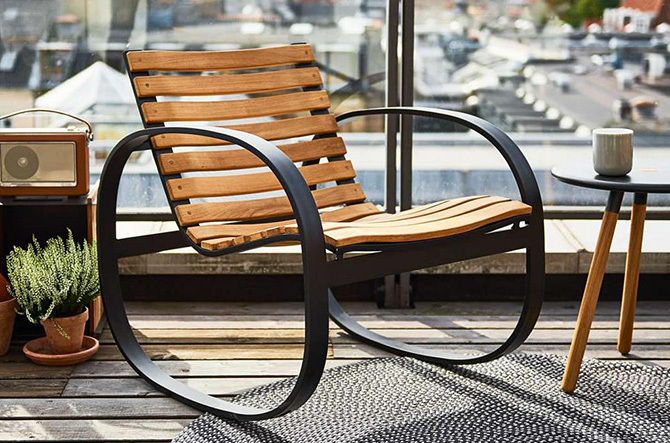 That and a unique design—a looping frame and comfortably curved wood seat—makes the Parc Rocking Chair by Cane-line a great piece for interior applications as well. 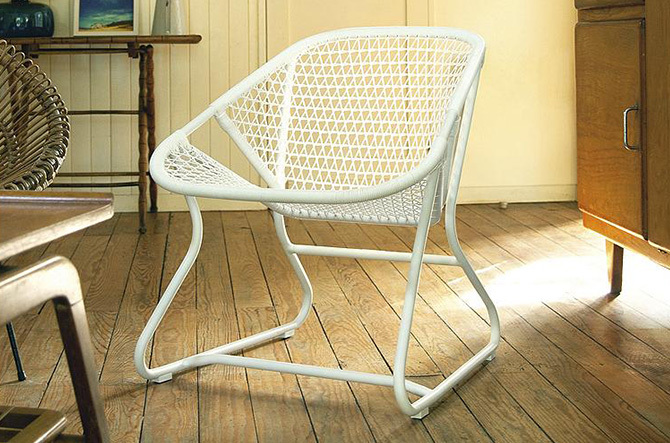 This has a similarly industrial feel as the Parc Rocking Chair. But instead of wood and metal, the Brown Jordan Fires Loop Stool/Side Table uses concrete and rope. The concrete is actually concrete composite, so Loop is durable without weighing a ton—very useful when it comes time to move it around. 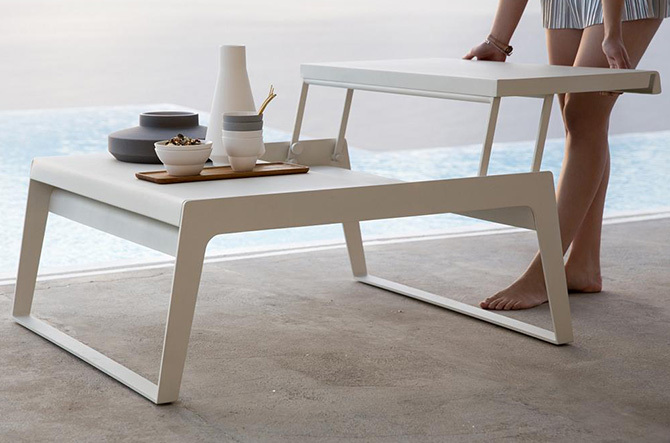 The Faz Dining Table's powder-coated steel wire base makes it great for outdoor use, while its unique design by Vondom makes it fashionable enough for a contemporary indoor dining room. The open base makes the table visually light, and it’s roomy enough to seat up to 8. 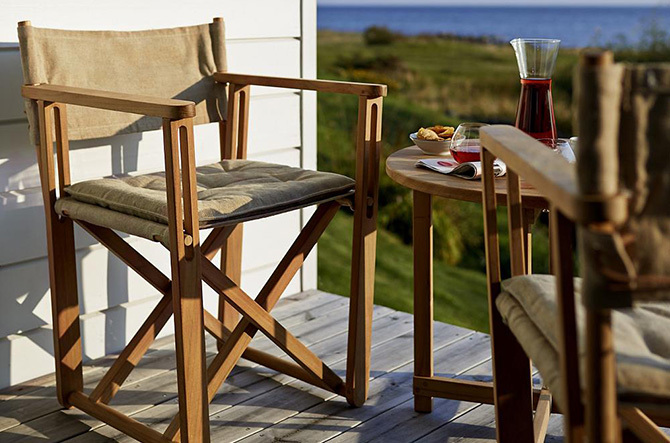 The Skargaarden Kryss Lounge Chair is foldable and comfortable, which makes it a particularly great choice for supplemental seating in interiors with limited space. Adventurous types will also appreciate its safari-inspired styling and canvas upholstery. 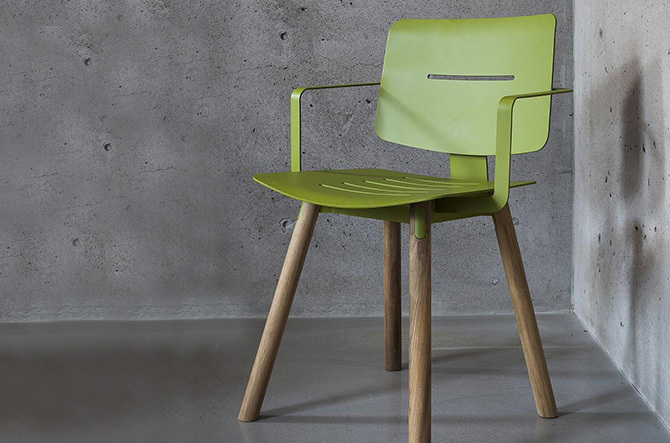 The Coco Armchair by Oasiq is a great way to add color and personality around any dining table. It is cool and laid-back, with an industrial-looking slotted aluminum seat grounded by rustic teak legs. Basically, it doesn’t have to try too hard to look good or feel comfortable; it just is. Whether you’re sitting on your living room sofa or an outdoor lounge chair, the convenience of an adjustable table surface is something that can always be appreciated. One side of the Cane-line Chill-Out Coffee Table lifts to bring items up to you. 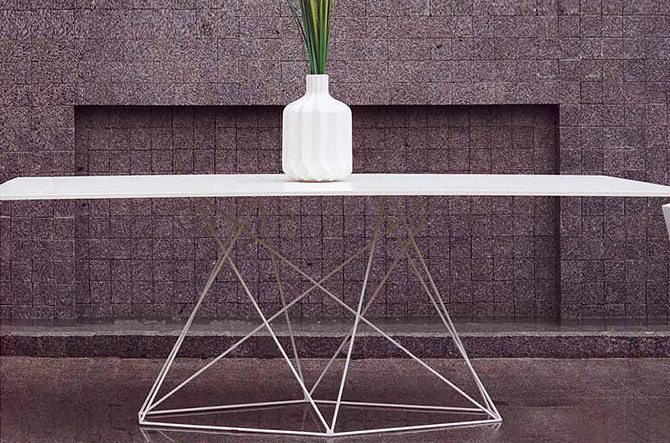 And the table comes in a white finish that will brighten up any space. 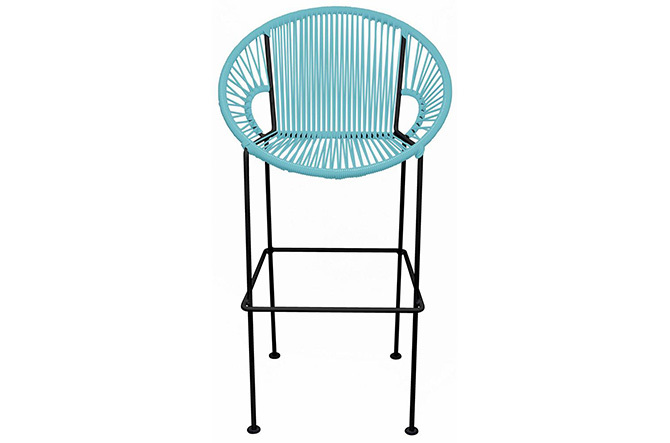 The vinyl twine used to make the seat of the Puerto Stool by Innit Designs is unexpectedly comfortable, and comes in a fun array of colors. Plus, it's practical and easy to clean if anything gets spilled on it. Imagine a row of these at your kitchen counter or in a game room. Cocktail time doesn't differentiate between the outdoors and the indoors, so why should your bar cart? 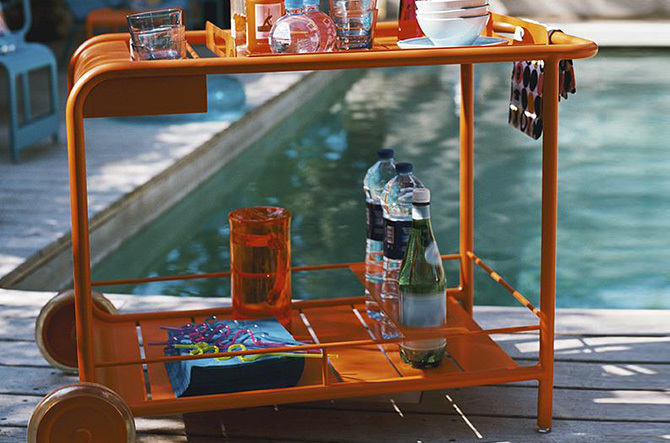 The Luxembourg Bar Trolley by Fermob has a variety of compartments for storage, organization and safe moving. So you can take that as your cue to move it from the patio into your living room.